...what are the forest skis ? 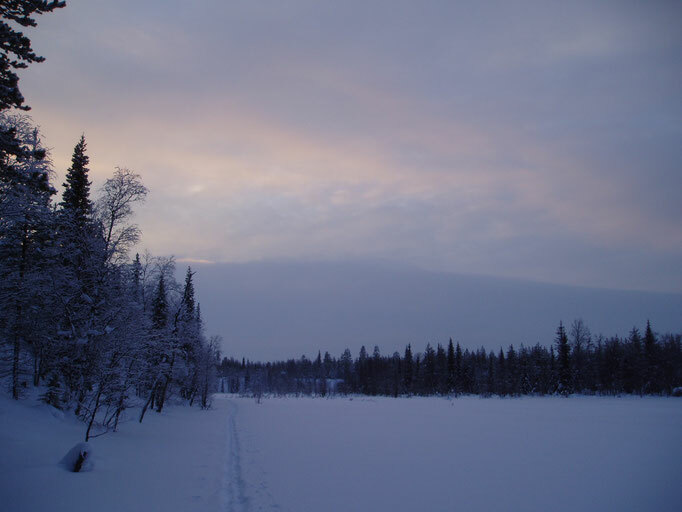 ...Skis are coming from Northern Russia and Scandinavia, and have been used in Lapland for thousands of years. 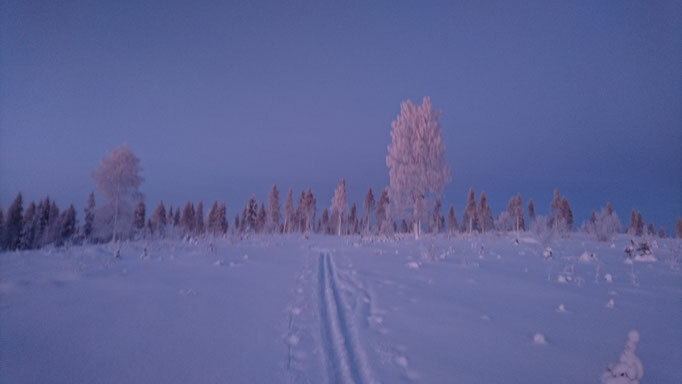 (the oldest skis ever discovered are coming from Russia and date from 6300 BC, and in Finland, the oldest skis have been dated from 3300 BC, long before the beginning of reindeer husbandry ! They are just the best transportation method, far superior to snowshoes in terms of speed and range (except in steep and densely forested areas). 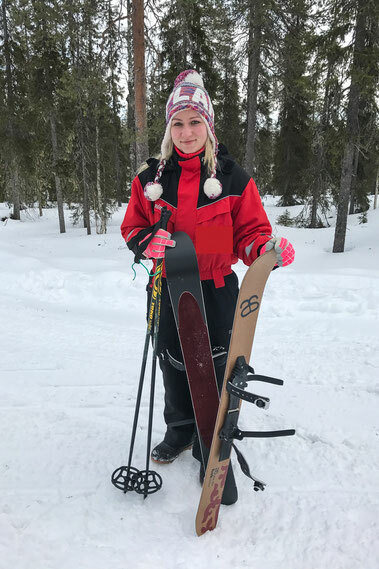 Few years ago appeared a new kind of skis, designed to be a compromise between traditional cross-country skis, and snowshoes : you can glide down hill, you can go uphill using ready-made skins located under the skis, and their flottation make them "deep-snow friendly" (meaning that you can really go of tracks). They come with universal bindings, meaning that you can use them with your regular winter boots. The good point with those skis is that they are really easy to use, even for first timers, if you select a suitable starting place. They are very stable, and the deep snow prevents you to go too fast at first. NB: Forest skis are not free ride skis ( so no tricks...), and not regular cross country skis either (the idea is not to do any cardio or to beat any kind of record ! ), they are just a fun and comfortable way to travel in the deep snow and to explore the backcountry. - half a day skiing trip. Includes : private guide service, car transportation, skiing gear, hot snacks around the fire. scroll down for more information on the program ! Includes : private guide service, car transportation, skiing gear, full meal around the fire, snacks on the way. Includes : private guide service, car transportation, night skiing gear, hot drinks and pastry/cookies around the fire, evening surprise! Scroll back up and click on "NORTHERN LIGHTS/EVENING PROGRAMS"
Includes : private guide service, car transportation from Luosto, skiing/snowshoeing gear, hot snacks around the fire. Nb. : each participants need to come with own backpack, equipped with straps for carrying own skis/snowshoes! 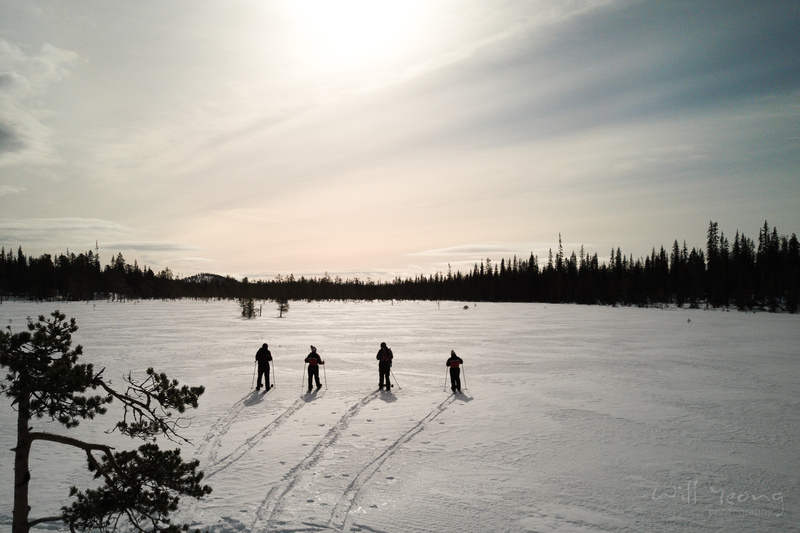 During this trip, beside learning the basics of forest ski techniques, we will discover the frozen swamps, peatlands, and the arctic wet forest areas around Luosto. (swamp edges are usually quite rich in fauna, so willow grouses, black grouses, and arctic hares are not an uncommon sight). I pick you from the location of your choice in Luosto, and we just head for the national park... In Finland, we believe strongly in "learning-by-doing", and we will just put the skis on, and start our trip. 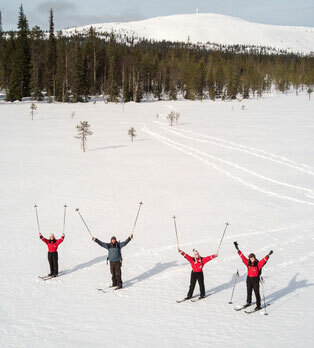 Of course, the trip will be adapted to the level of the participants (Note : again, those skis are NOT downhill skis! they are similar in their use as classic style crosscountry skis, except that we go off-track. We don't chase steep slopes or adrenalin!!). 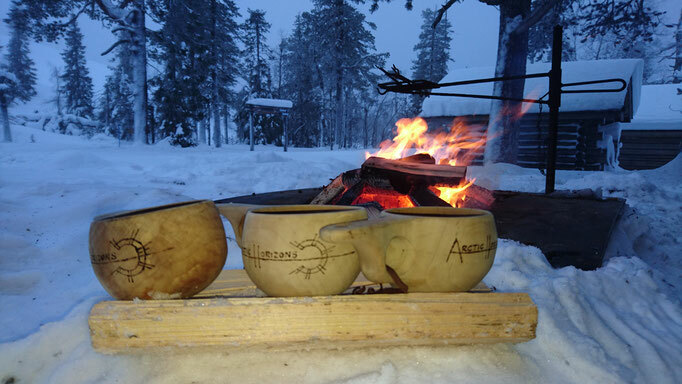 At some point during our hike, we will have a break and make a fire in order to grill the famous Finnish sausage (aka the vegetable of the real finnish man) and to enjoy a warm drink and traditional pastry. NB : For more information about forest skis scroll back up and read the "what are the forest skis" section ! 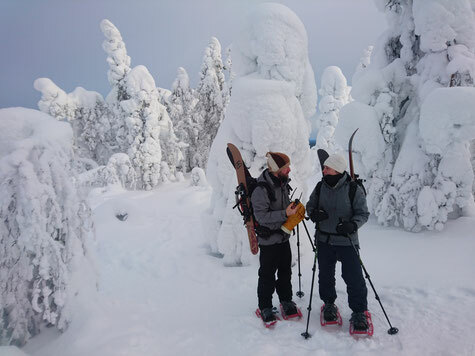 Includes : private guided service, pick up by car from Luosto, skiing gear, snacks and sausage around the fire. 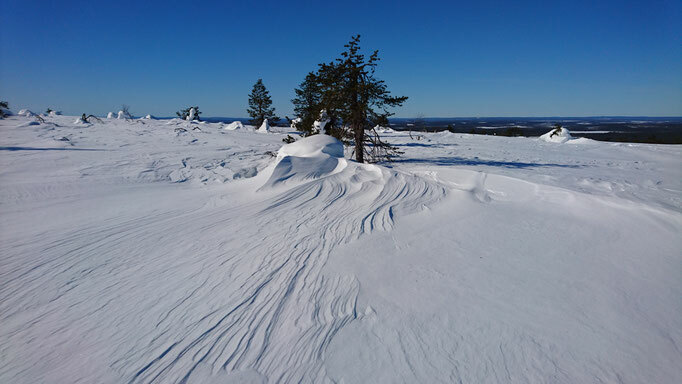 The full day skiing trip will take us deep into Luosto backcountry. This trip will happens mostly in the Pyhä-Luosto national park and its breath-taking arctic sceneries. 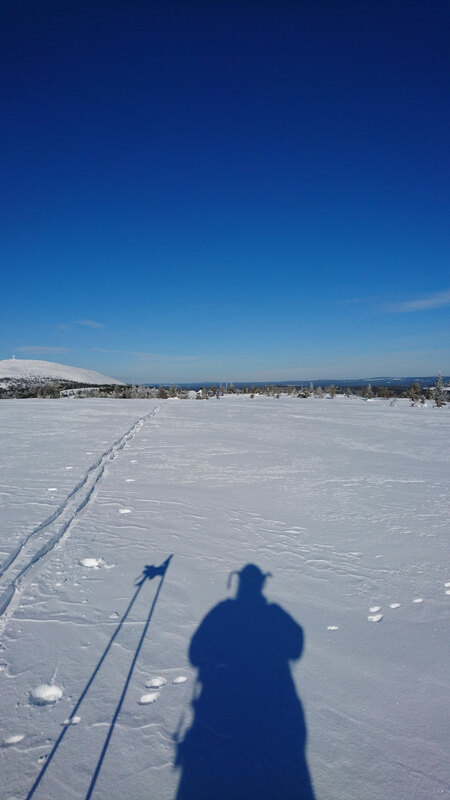 You can of course book this trip all winter long, but I particularly recommend it towards the end of the winter season (from March onwards, when temperatures get milder), and during springtime, when we can find this very hard snow crust in the morning, making skiing like a dream!! For lunch, we will have a good meal around the fire in a forest camp. ( Smoke reindeer or Smoke salmon Soup, grilled sausage, washed down by a glass of delicious crowberry wine, and a pastry and hot drink for the dessert ). there will also be some snacks during the day. 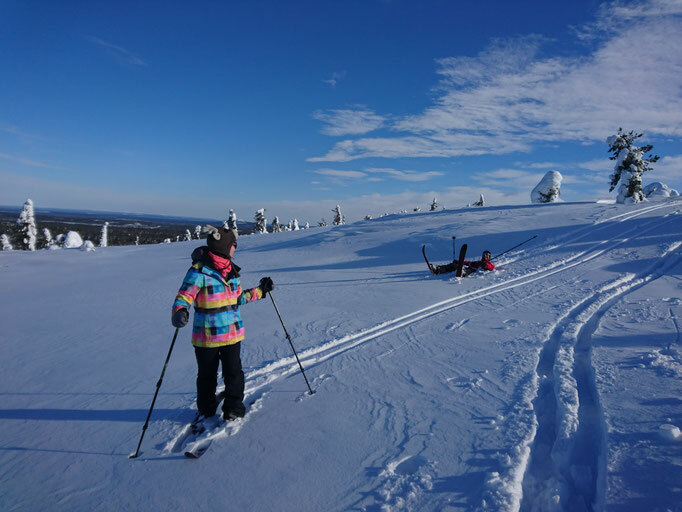 The skiing distance can vary a lot depending on the snow condition and the time of the year, but it can be anything from 12 to 20 km. Includes : private guide service, pick up by car, skiing gear, full meal around the fire and snacks during the day. 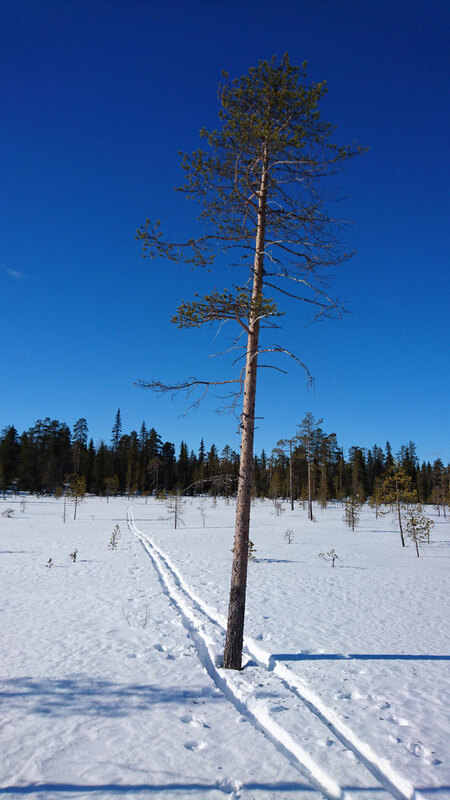 This program has been devised in order to combine the use of our "forest skis" and of snowshoes during the same trip. I pick you from your hotel/cabin in Luosto, and we head for Pyhä-Luosto national park. 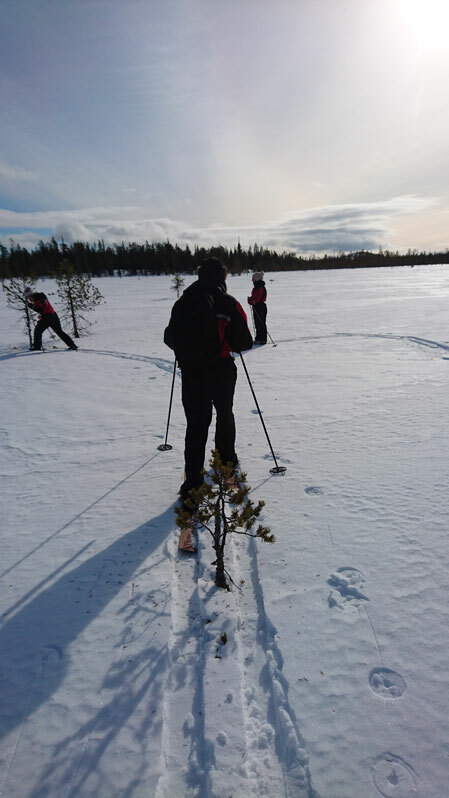 During this trip, we will use the snowshoes in the steepest uphills, or if we meet some dense forest, but as soon as the terrain gets more flat or downhill, we'll put on the skis. It takes only 1-2 minutes to change from one to the other, and you don't need to change shoes, because both our skiis and snowshoes are equipped with universal bindings (you can use regular hiking boots). What is really good, is that if somebody feels uncomfortable with the skiis whenever we go downhill, it is possible to switch back to snowshoes, and have a slower descent! Note that, anyway, we will not do any extreme downhills ... The "forest skis" and the bindings are not adapted to free ride and crazy fast downhills !! This program is perfectly adapted for beginners, just let me know before, so I can adapt our trip to your tastes ! 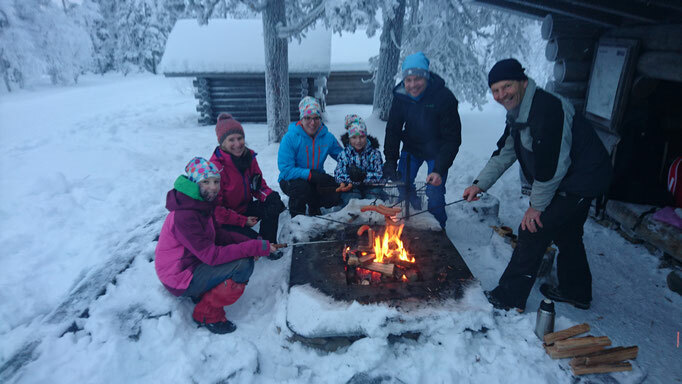 At some point during our trip, we stop around an open fire in order to grill the famous Finnish sausage, a traditional lappish pastry, and some hot drinks. Duration : around 3,5 hours. 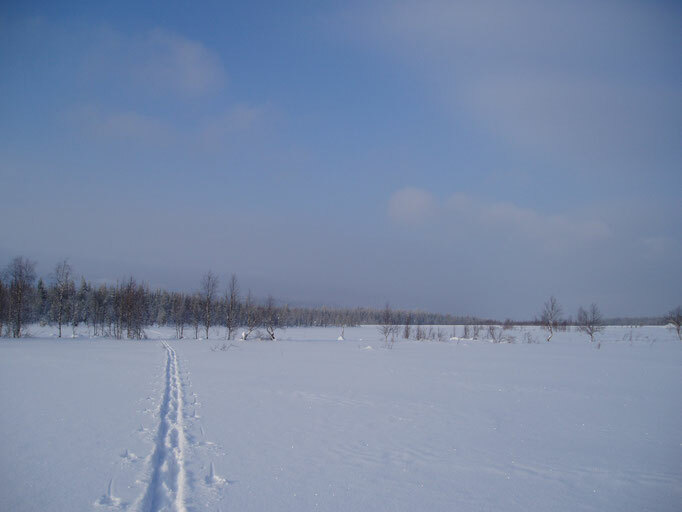 Skiing/snowshoeing distance : 4-10km depending on the snow condition. 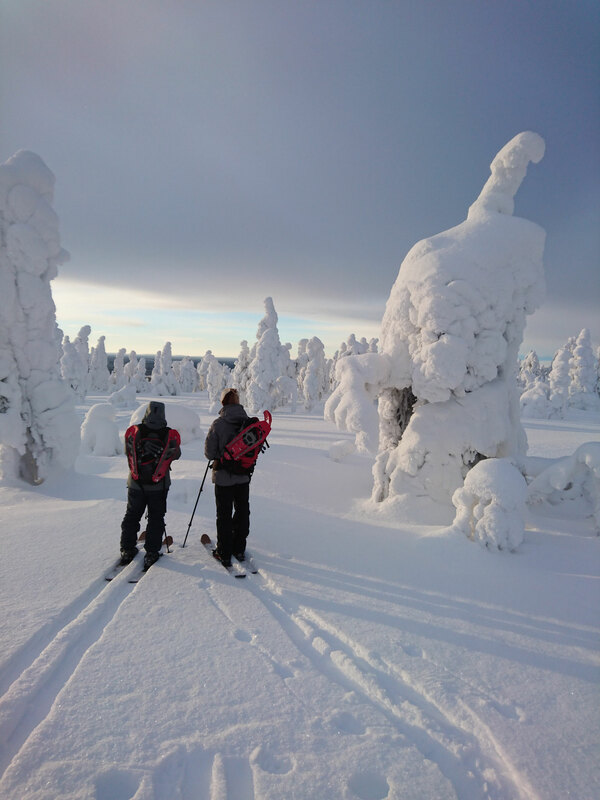 Includes : Private guide services, snowshoeing/skiing gear, pick up by car from your accommodation in Luosto, snacks around the fire. Important ! Each participant has to come with a backpack equipped with straps for carrying own skis/snowshoes! "Twenty years from now, you will be more disappointed by the things you didn't do than by the things you did do. So throw off the bowlines. Sail away from the safe harbor. Catch the trade winds in your sails.